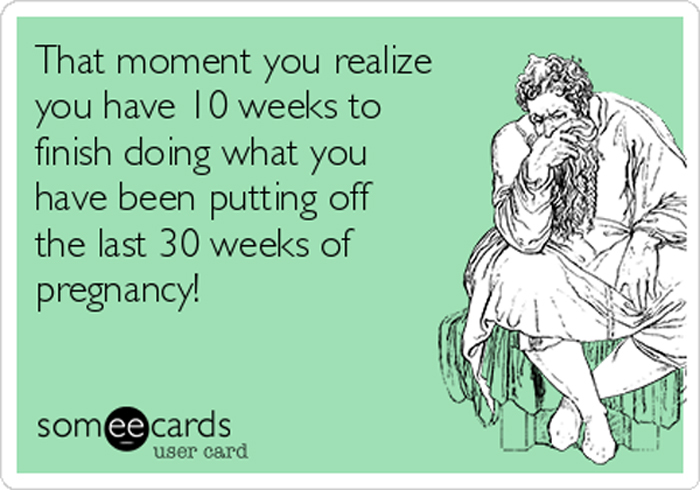 We assigned ourselves a “12 Week Challenge” to finish the new baby’s room before his due date, which is now only 10 weeks from today… what???!!! 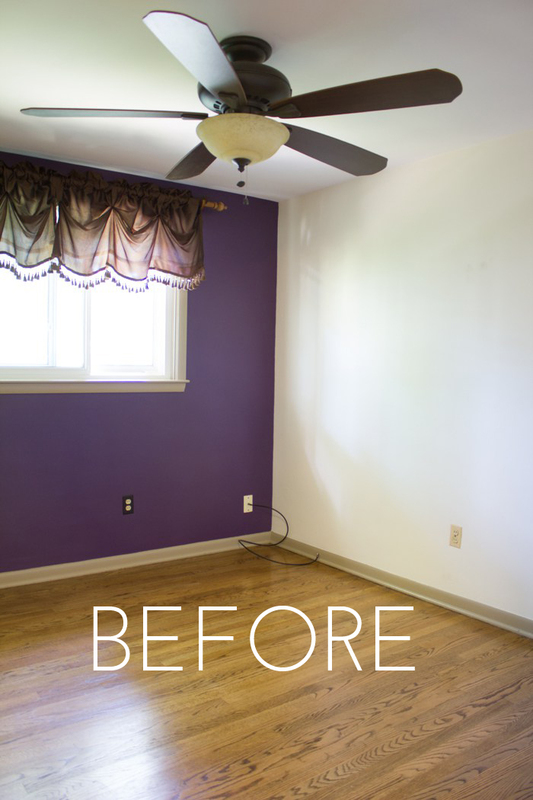 We’re two weeks into our nursery challenge and have the room mostly entirely painted. Andy worked on it so much over the long Memorial Day weekend, and his dad chipped in while he was here babysitting Joey a couple of times, too. Painting always takes so much longer than you think it will, especially when you need to do multiple coats of primer (I’m shaking my fist at you, dark purple wall! ), plus all the trim, the ceiling and the walls. We’re also very happy to report that the world’s largest ceiling fan has been removed. Seriously, I have no idea why this huge fan was ever considered a good idea for this room that’s only 10’x10′ with standard height ceilings. I barely had clearance to walk under it, and I’m 5’3″. (Ok, I’m 5’2-3/4″ if you have to be technical.) So I’m not tall. And this fan was massive and very dark. Now with the fresh white paint and no oversized ceiling fan, the room already feels more open and bright. 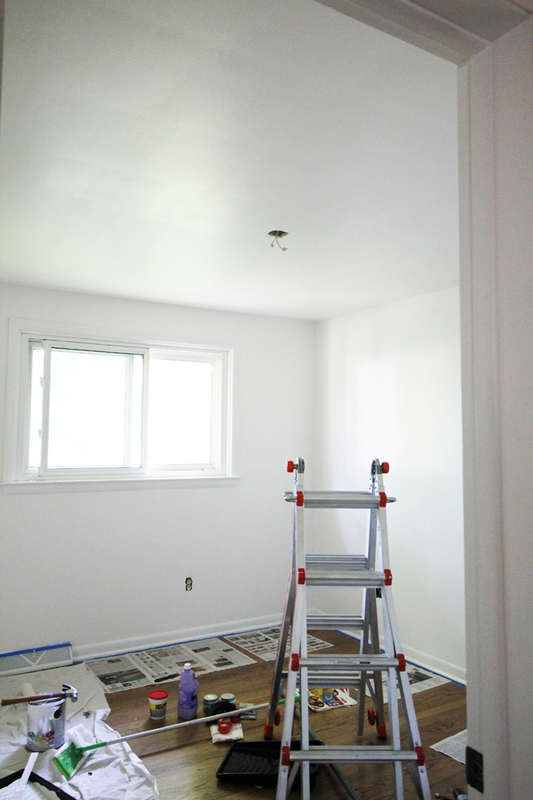 For the white paint we went with our go-to Sherwin Williams “Snowbound” color-matched to Valspar Reserve (because it’s no VOC, which makes it safer for baby and me, and also for everyone) in eggshell on the walls and ceiling, and the same color in semi-gloss on the trim. We love this color — we’ve painted almost every room Snowbound!! We’re doing something really fun with one of the walls, though, so you’ll need to stay tuned for that. It’s next weekend’s project (and probably the weekend after that, too). One hint: the whole room isn’t going to be white!! Joey will be turning 17 months old in a few days! She’s looking like such a little girl and not a baby anymore. Since as of today I’m 30 weeks pregnant (just 10 weeks to go), I thought I’d give you a little “burrito baby update.” I had a checkup this week and everything is going really well. Baby boy is supposedly the size of a large cabbage! About 3 pounds and 16 inches long. FEELING: Really good. I feel stronger and more energetic than what I remember feeling in my third trimester last time, and I think it’s largely because I’m still doing Pure Barre twice a week. DOING: Nesting! I keep coming up with house projects that I want to start. We’re already in the middle of a whole bunch of things, inside and out, from the nursery to our ensuite and of course painting the exterior, and then I’m like… what about painting the fireplace… what about painting the kids’ bathroom… we can get these done, right? HA!! No. But the thing we know now that we didn’t know when we were having Joey is there will still be time to work on projects even with kids. Phew! EATING: With my first pregnancy I really fell into the trap of “I’m eating for two!” and “it’s the only time I’ll ever get to eat this many donuts and not care!” Lies lies lies! I’m not going to say I’m some sort of health food saint (I had four peanut butter oreos AND a slice of lemon bar yesterday, AND pizza), but I’m just way more aware of the fact that it’s HARD to lose the baby weight and making smart-ish choices now could only help me out down the road. CRAVING: Oddly, this quinoa salad that I eat at least twice a week. I think I’ll make some today! And peanut butter oreos, of course. WEARING: I picked up a few slouchy non-maternity t-shirts at Old Navy that are perfect with a longer tank underneath (like this peach tee), and since they’re in my non-maternity size they’ll still fit post-baby. MISSING: I could really go for a margarita on a sunny patio! 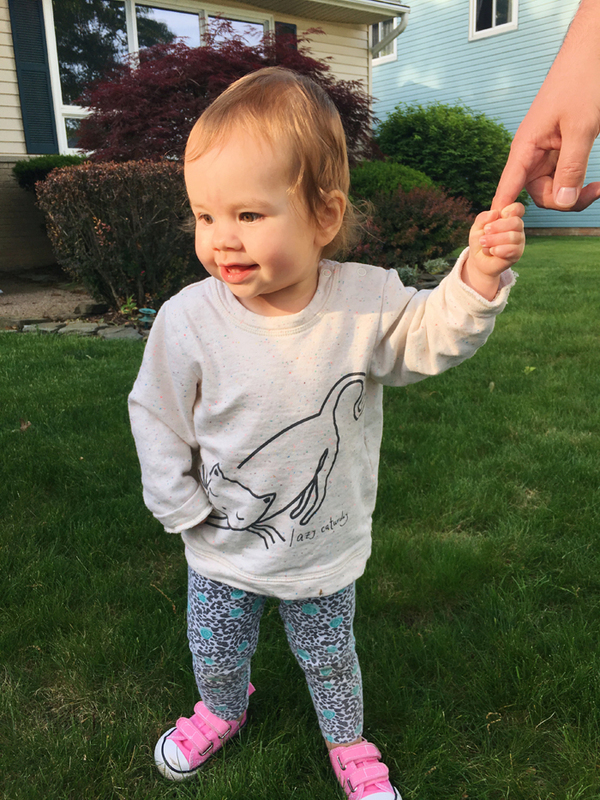 LOVING: Whenever I say, “where’s your brother,” Joey pats my tummy … and then she pats her own tummy and her dad’s tummy. So maybe she just thinks “brother” = “tummy.” But it’s sweet. Sometimes she puts her head on my tummy and I melt into a puddle of hormonal mush. I don’t think she “gets it,” but we talk to her all the time about her brother and what to expect. We’ve also been reading her a book called “I Am a Big Sister” by Caroline Jayne Church, which is about ways big sister can be helpful when the new baby comes, like with diaper changes, baths, and playing quietly while the baby sleeps. It’s cute and Joey seems to really like it. She asks us to read it to her all the time. We think a lot will happen in the nursery this weekend, so stay tuned for next week’s update! And don’t forget to vote for an exterior paint color, too! Help Us Choose Paint Colors for Our House!! Where’s the bump update?! I was expecting a photo. Ha! I wondered if anyone would notice. I forgot to take one ahead of time and didn’t want to do it when I was unshowered/wearing my pajamas as I wrote the post, haha. I’ll post one soon, promise!